Municipal Court Judge Harry H. Chandless Jr. heard his last case on December 18, 2002. After 36 years on the bench he has heard over 73,000 cases before retiring. Judge Chandless was the longest continuously serving municipal court judge in Bergen County. He heard cases for traffic violations, disorderly person's charges -- assault, harassment, lewdness -- and drug offenses. 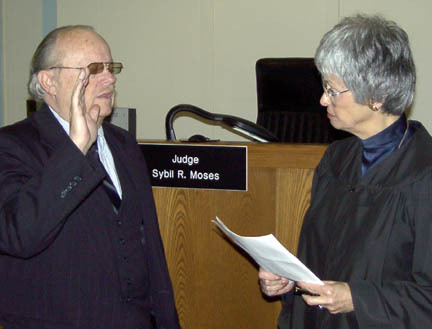 Chandless was the borough's municipal prosecutor from 1959 to 1966, and at 36, was appointed to the bench on July 21, 1966 by Mayor John F. Knowlan. He replaced Julius A. Kepsel who had died of a heart attack after serving for 35 years. His starting salary in 1966 was $2,500 and this year he was paid $32,100. He graduated from Hasbrouck Heights High School in 1948, Columbia College in 1952 and Columbia Law School in 1954. He got started in the law firm of his uncle Ralph W. Chandless, Sr. who served as Hasbrouck Heights borough attorney. He also has a private law practice specializing on wills, estates and real estate with his law offices located on the Boulevard since the late 1950's. Chandless is a life long resident of Hasbrouck Heights and has three children: Barbara, Harry III (Hank) and Kathryn.